July | 2012 | E-verything! This overview covers our two most recent webinars. This first was a Serendipity session where we discussed Facebook privacy sessions and the flow-on effects that happen between accounts. 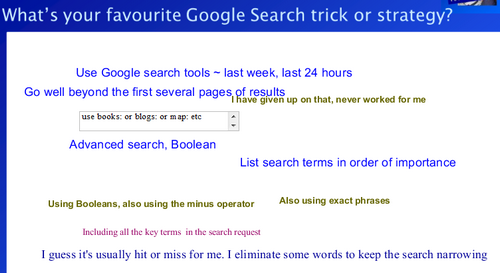 The second webinar (a FineFocus) was inspired by the recent short course in “Power Searching” from Google. In this session, recorded as always, we discussed issues around Facebook privacy settings. This arose from one of the group recounting an experience where a family member had changed something in their profile and this had had a knock on effect on other people’s accounts. 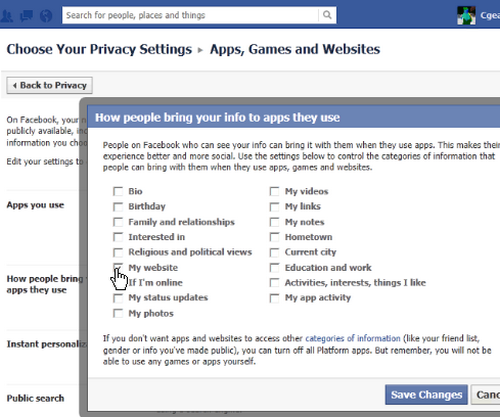 Facebook privacy (and other) settings seem to cause issues for many people. We took a “walk” through some of these and shared how we try to use them. They do seem inordinately complex. For example I am not entirely sure what would happen in terms of my privacy if I ticked the boxes in the window shown above. Personally I don’t use any apps and games, and I think I have all these things turned off but I am not really sure! This was an interesting session. My concern is that if a group of quite “techie” and social network savvy people have trouble “getting our heads” around Facebook’s privacy and other settings what chance does the average user have! The second session, again recorded, was a look at some of the search features that were explored in the recent “Power Searching with Google” course that I joined. Although the interactive (forum posting) parts of the course have finished the content and activities are still available. I was already a fairly sophisticated searcher using many of the tools explored but I enjoyed the course immensely and certainly learned some new ideas. Once the scene setting was complete I started as I so often do with some “where are you coming from” activities, including a question about current favourite search tricks and strategies. Most of the session was taken up with brief explorations and opportunities to “play with” some of the search options that I had found interesting in the course. However there was also some discussion about how we see different results and even differenct tools depending on which Google domain you are searching through. For example the “.com.au” domain gives different results to the “.com” domain. My preference is usually to use “.com” so we looked at how to force this – Google is very persistent in forcing the search into your country domain, often just typing the “.com” domain doesn’t work and the domain reverts back to the country. We took a look at some basic search points straight from the Google course these being choice of words and the order. Then we moved on to look at images (colour filtering and finding a specific image). Next we explored the right hand information panels that appear with some searches. These are not visible in search outputs from all Google domains. They can be seen in “.com” but not (at the moment) in “.com.au”. 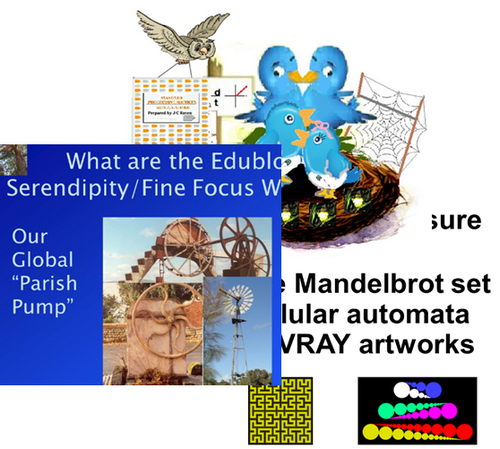 We finished off with a look at the “SearchResearch” blog where there is regular weekly search puzzle and an image search on “Yarn bombing” – try that one yourself if you haven’t heard the term :). The session worked really well – quite fast paced, with a blend of whiteboard activities, app share for examples and opportunities try out the tools. Certainly for me the hour flew by! Both of these sessions were great to be part of. As always privacy issues are of huge concern to us all, so sessions on this are always very worthwhile because they heighten awareness. The power search session was fun and hopefully also informative. In this session, recorded as always, we heard from Michael Graffin about the variety of projects that have formed part of the “Global Classroom Project” (#GlobalClassroom) this year. Michael took us on an incredible journey. He started with some background, firstly explaining how the Global Classroom came about and its reach both geographically and in numbers. Then moving on to the aims and ethos of the community. For me the most exciting part was the project stories – Michael shared the project stories and some of the highlights of the year. We were lucky in that Lin-Lin Tan from Taiwan, one of the teachers involved in several projects was able to join the session. She told us a little about how the Global Classroom projects have affected her and her students. Michael moved on to consider some of the impacts of Global Classroom on teachers and some lessons learnt. Finally he turned to the future with thoughts for next year’s #GlobalClassroom. This was a fantastic session! Michael gave us a brilliant overview of Global Classroom and the projects. Chat was very lively throughout with many ideas shared and also links to many of the projects (thanks to Anne Mirtschin for her help in dropping links into chat). If you are looking to be both inspired and awe inspired then this is a MUST catch recording! Despite my best intentions I didn’t succeed in doing the overview for our most recent FineFocus webinar. 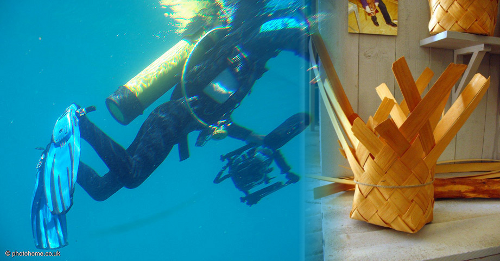 So this overview is of that “Sharing our Pecha Kuchas”webinar and the Serendipity session from the following week. This session, recorded as always, was great fun! Over the past few weeks we have talked several times about Pecha Kucha and this session consisted mainly of sharing three very different first attempts at Pecha Kucha and then discussing the challenges and the way we had each approached the development. The three sessions were “Mad About Maths” by @philhart, “The Gifted Tweet Family” by @jofrei and “About the Webinars” by myself. Serendipity – “personal hubs” could Symbaloo or others replace iGoogle? This week’s topic in our recorded Serendipity webinar was generated by the news that Google is closing down iGoogle. This was at the front of my mind when we started the session and so I suggested the topic. The preliminary chat gave a consensus to talk about this and the possiblity of using Symbaloo or similar as an alternative. 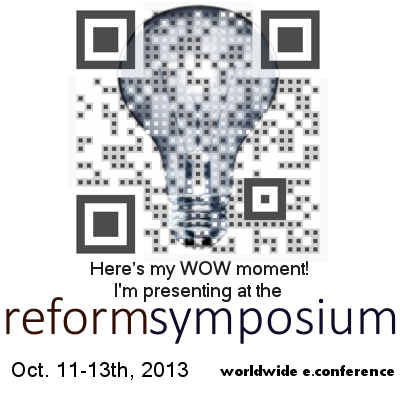 We looked at Symbaloo through an AppShare and discussed its uses briefly, this led to a short exploration of Sqworl which is also a visual bookmarking tool. Definitely one to explore in the future! The discussion moved on and I shared my own personal iGoogle to illustrate the many feeds and other content that I draw together into one place. Because I have used iGoogle for several years to help me manage content, feeds and links (anywhere, anytime and anydevice) and I have so many things in one place I think it will be hard to find a replacement. Another possiblity suggested was Chrome, again probably worth exploring, but of no use for this purpose if you have to have the Chrome browser installed first. I have seen other alternatives suggested although we didn’t look at these – they include MyYahoo, Netvibes and Pageflakes. I am currently exploring the first two of these but haven’t worked out how to get GoogleReader to feed in (if anyone knows please let me know how). When I tried to access the third of them I could not as it was too busy so I have abandoned that one! 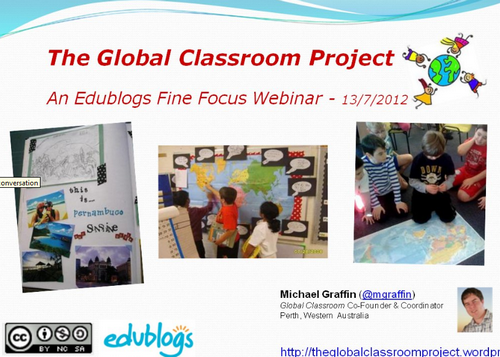 Our next Webinar is an Edublogs “Fine Focus” session where Michael Graffin the Coordinator of The Global Classroom Project (#GlobalClassroom) will be sharing this year’s GlobalClassroom experiences. Join us on Thursday July 12th at 23:00 GMT/UTC the time for you will vary depending on your timezone (check yours here) Thursday afternoon/evening in the USA, late night Thursday in Europe, and Friday morning July 13th in Australia – in the usual Blackboard Collaborate virtual room.